The addition of non-metallic enclosures to a large inventory of metal enclosures makes fabricator Mier Products a one-stop shop for enclosures. As a longtime manufacturer of painted metal enclosures for the security, fire and electronic industries, we have heard a continuing call for non-metallic boxes. So it is a natural move for Mier to introduce a high-quality and versatile line of polycarbonate enclosures in a myriad of sizes and loaded with numerous features. The appeal of polycarbonate enclosures is far-reaching because of their superior performance in so many different environments. Three important considerations for using polycarbonate boxes include high impact strength, their non-corrosive (no rust) abilities and they are non-conductive, eliminating a shock hazard. The design of these enclosures makes them ideal for use in the harshest of environments . . . such as oil refineries, electrical construction, irrigation systems, chemical processing facilities, water treatment plants, car wash operations, sewage plants, utility fields, instrumentation, machine building and HVAC . . . anywhere protection from rugged environments is demanded. 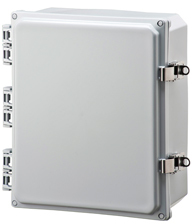 In the case of wireless products, non-metallic enclosures are perfect for the application because antennae or transmitters may be mounted in the enclosure without hindering the reception or transmission of radio wave signals. These Mier enclosures have passed stringent Underwriters Laboratories (UL) testing and are listed under UL-50/c-UL. They also carry NEMA ratings, with the L Series carrying a 6/6P Marine use, which means these enclosures may be submersed. There are two series of products, each with well thought-out capabilities. 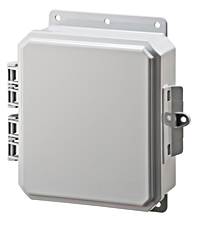 The L Series, a totally molded enclosure, features a latching/padlock provision, which snaps shut securely. This action draws the molded-in gasket of the door tightly against the chassis when it is snapped shut. There are several appealing features of the L Series for OEM use, including size. Relatively small, the largest being 9” tall, 8” wide and only 2” deep, this series is ideal for small component mounting. It is finished in a handsome light gray gloss. The hinged easy-to-remove door is ideal for OEM applications where hand assembling of components allows access to the interior of the box. Other features ideal for OEM use are the multiple bosses, conveniently spaced around the perimeter of the box, and permit mounting of components, circuit boards, back panels, or DIN rails . . . simply by using #10 self-tapping screws. Other features include integrated mounting flanges on top and bottom of the enclosure so that it may be rotated to permit the door to open left or right. Clear doors are also available. Other attractive features are back panels, made of steel or PVC, and the ability to have those punched to a hole pattern as desired in minimum quantities of 25 pieces. Blank panels may be purchased in any quantity. Pole mounting kits are also available. Another appealing factor is cost, made so by the all-molded process and absence of any component assembly, such as hinges or latches. The availability of an array of sizes is one of the features of the SL Series. From the smallest enclosure of 8” tall, 6” wide and 4” deep to the largest at 18” x 16” x 10” there is an enclosure sized to fit most needs. With plenty of appeal to OEMs because of the size and features versatility, the SL Series also fits the needs for a variety of one-of-a-kind installations. Easy to machine or punch, this series has stainless steel latches and different mounting methods, plus multiple bosses for mounting circuit boards, back panels, components and DIN rails. A unique feature of the SL Series is a Back Panel Suspension system. This patented system allows back panels to be suspended at any height within the enclosure, and allows stacking of the panels. This is accomplished by mounting pads that slide on T-shaped rails molded into the enclosure. The mounting pads are held in place by a set screw, which can be adjusted with the back panel in place as the pads move on the T-rail. The kit comes complete with everything needed. As with all Mier non-metallic enclosures, a clear door is available for those instances when it is desirable for viewing the interior. Back panels in steel or PVC and Pole Mounting Kits are also available. Underwriters Laboratory (UL) listing. Listed under Cabinet and Cutout Boxes (E207562). NEMA ratings of 2, 3, 3R, 3S, 4, 4X, 5, 12, 13, and 6/6P depending upon models selected. Back Panel installation. This unique patented system permits back panels to be suspended at any height within the enclosure, and allows “stacking” of the panels. Molded-In Mounting Bosses. These bosses are designed into the enclosure to permit use of self-tapping screws to accommodate placement of DIN rails. Hinged doors. The doors are easy to remove and to replace, and open a full 225 degrees, which permits full access for installation ease or for user access. Customization. Depending upon the quantity, customizing of an enclosure may be done, including silk screening and locating of holes or machining. Steel back panels may also be punched to a customer’s requirements and painted colors as specified. Lighter weight than many enclosures made of other materials, Important for one-person installation.. Weather resistant and offers superior UV protection. If you have questions that our website doesn’t answer regarding non-metallic enclosures please give one of our enclosure specialists a call at 1-800-473-0213.